After the farm preview we have a snapshot of the vendors attending this Saturday’s market – the final market of the winter season! A Wise Gardener A Wise Gardener features “ornamentals, uniuqe garden flora and “hortcierge” garden consultant and lecturer. Also displaying artwork by Cris Pool featuring whimsical mixed media designs. Agriberry Agriberry Farm in Hanover, VA, was est. in 2008 by the Geyer Family to grow raspberries, blackberries, strawberries, & peaches. It was funded with USDA grants and CSA support for one of the nations first Berry/Fruit CSA’s primarily so local teen labor could be employed for the harvest and marketing of fresh berries across the region. Since then further USDA funding has promoted the Value Added line of products utilizing more of the harvest for additional products and winter marketing. Alfredo’s Honey Local beekeeper offering raw honey products including liquid and whipped products (plain, almond, and cinnamon) pollen, honeycomb. Also, beeswax candles and marmalades. Amy’s Garden USDA Certified Organic specialty produce & cut flowers. Babes in the Wood Rare breed forest fed pigs raised in 75 acres of Virginia Woodland. Bella Grove We are mini-farming & home steading gone wild! Look for a wide variety of seasonal specialties every week at the market. Black Boar Farm, LLC Our animals are raised “slow grow”. The Berkshire and Ossabaw Island hogs are free range and naturally raised in the woods and on pasture. We also raise honey bees, chickens and make lard soap, lip balm, hand creams, honey body scrub, beeswax candles, honey candy, creamed honey and fruit & honey jam. Black Creek Farm Growing a wide variety of Naturally Grown Produce using intensive methods of soil buildling with the applications of compost, cover crops and natural nulches. Bonnyclabber Cheese Co at Sullivan’s Pond Farm Bonnyclabber Cheese Co is a family owned, and operated micro-creamery located on Virginia’s Middle Peninsula. We specialize in pasteurized, and raw, handcrafted artisan goat cheeses, made in small batches, and hand wrapped in natural packaging. We never put our cheese in plastic, pracetice natural and organic methods with our cheese and livestock. We only feed non-GMO feeds, and allow our goats access to pasture year around. Broadfork Farm Certified Naturally Grown produce. Our family farm in Chesterfield County grows food to be healthy medicine. Taste the difference! Visit one of our farm tours to learn more about how we grow. Casselmonte Farm “Bringing Taste Back To the Table,” or if you prefer “Flavor by the Pound” — the singular focus of Casselmonte Farm LLC. One of the very few USDA Certified Organic producers in the area, we specialize in Asparagus, Succulent Berries, Heirloom Vegetables, Forest-Grown Shiitake Mushrooms & Ginger. Crumptown Farm Certified naturally grown vegetables grown on a local family farm. Taste, freshness and nutritionally rich produce grown using natural methods are our main goals! Goats R Us LLC Farmstead cheese so quality is a concern from milk stage to cheese to consumer??? Goin Family Farm Corn-fed beef & beef speciality products. All cattle born & raised on our family farm. Never given hormones/antibiotics. Finished on whole shelled corn; dry aged; USDA inspected; vac sealed. HaaShrooms Fresh, locally grown culinary and wild crafter mushrooms. The regions most trusted source. Heath Farm Joyce and I raise, pick, and prepare for sale vegetables, plants and berries. All are organically grown on our family farm and will be available for sale when in season. Hog Haven Farm LLC All natural, heritage breed, pasture-raised, local pork on a highly varied, all-vegetarian and why, non-GMO diet. Jason Talleys Produce Jason Talleys Fresh Hanover Produce. All homegrown in Hanover Country, VA Family owned and operated for over 9 century. Moose Hill Worm Farm The only Virginia Farm producing organic worm castings in commercial quantities. Worm castings contain rich proportions of water soluble nutrients making them an excellent all natural soil amendment. Mount View Farm At Mount View Farm our cattle have room to roam and kick up their heels. We’ve turned back the hands of time to raise our herd the old fashion way while providing an updated, diversified diet of non-GMO grains and our hydroponically grown fodder. We know exactly what our cattle eat because we grow it ourselves, all the Non-GMOA grain, fodder and hay. we have found growing hydroponic fodder AKA fresh grass to be sustainable practice which reduces the impact drought and crop disease can have on fedding our cattle and yields a more flavorful and tender cut. Our beef is USDA inspected, vacuum-sealed and frozen to maintain its freshness. Our philosophy is to provide top quality beef in a sustainable manner to benefer our local environment, family and friends. Norma’s Produce Our farm is family run. We use the minimal amount of pesticides. We work hard to bring the freshest and tastiest prodcue from our 120 acres farm. Pair-a-Dice Farm, LLC (FT) Our lamb and cows are naturally and humanely raised. We offer an etensive list of USDA inspected tender and flavorful lamb cuts and beef. Our happy hens free range duing the day and produce the most delicious eggs you’ve ever experienced and the eggs are available year round. We also offer high quality hand spun yarns and value added wood products and other natural fibers. We shear the the sheep and all the fiber processing from spinning to dyeing are all done exclusively on site, straight from our farm to you. Occasionally, we offer homemade pound cakes in a variety of flavors using our fresh eggs. Polyface Farms We are in the redemption business: healing the land, food, economy, and the culture. Experience the satisfaction of knowing your food and your farmer, building community. We are your clean meat connection. Saunders Brothers, Inc. Located in beautiful Nelson County, VA, Saunders Brothers grows peaches, Asian pears, apples, strawberries, vegetables and ornamental plants. Our farm is family owned and operated since 1915. The Talley Family Farms One family working on multiple properties to bring you quality beef, dairy, vegetables and soap. Village Garden RVA, LLC Small family farm using organic, sustainable practices to grow and vend vegetables, herbs, fruits and herb/spice culinary blends to the greater Richmond, VA community. Vintage Bloom Handmade fresh bouquests of seasonal flowers-custom wrapped. Creative painted mason jars can hold a bouquet for a great gift or for your own table. Flowers are locally grown in Amelia County. 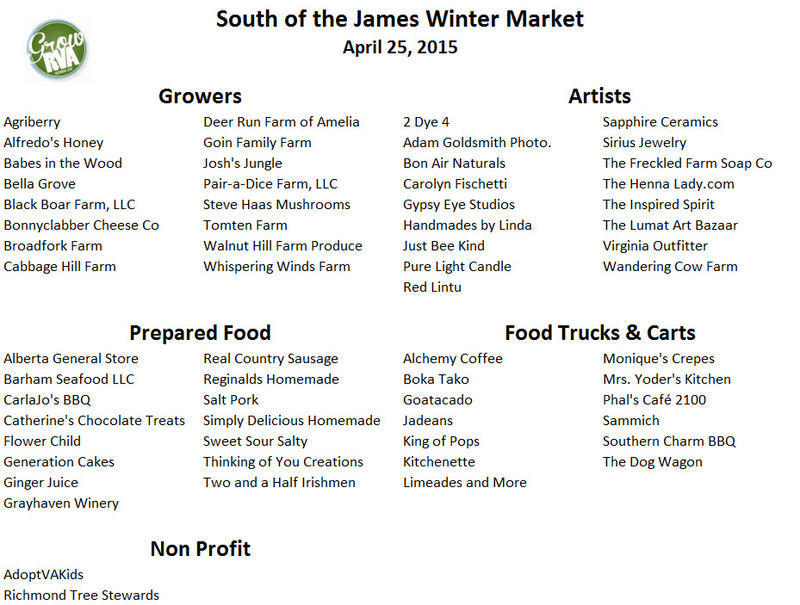 Vendors this Saturday at our final market of the winter season are below. We may call it the winter season but it certainly looks like spring!